For those of you who don't know about Rob Bell, I suggest you find out. He has been putting out a series of very well done short films under the name Nooma. Each of these is a 10-15 minute teaching or sermon done with impeccable taste, excellent music, and exquisite cinematography. Any of them are well worth checking out. More recently, however, Rob has turned his attention to doing longer teachings and taking them around the country. The first of these (Everything is Spiritual) has made its way onto a DVD which I just acquired last week. This is a wonderful piece of Apologetic teaching, very well researched and very accessible at the same time. It is thoroughly grounded in scripture but also makes excellent use of science. Instead of posing science against faith, he integrates the two things and shows how they are compatible. We can't box God out of the realm of science because he created everything and therefore he is the very ground upon which all science stands. I suggest you check it out and buy an extra copy for your favorite scientist. I have decided to switch to blogspot for the hosting of this blog. I am doing this because I have noticed recently that many of the links on the old page didn't work. I would click on the commenting link or one of the archive links and all I would get was a bunch of code. While I have successfully hacked webpage code together in the past, I have no real clue what I am doing. The simplicity of blogspot's hosting was too good to pass up. Having made the transition everything seems to be working much better. If you bookmark this page or subscribe via rss, please redirect your links to chrisklukas.blogspot.com. 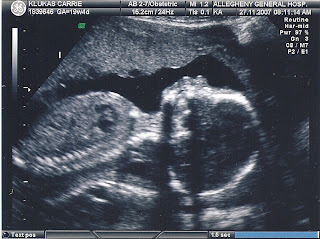 I think it is about time for me to announce that Carrie is pregnant with our first child. We recently found out that he is a boy. The due date will be sometime in late April (they have given us some official dates, but how often are those right anyway!). Please pray for Carrie and our new baby.